Category Archives for "Cyborg Protection Unit"
Want something more to go with Embrace the Romance: Pets in Space 2? 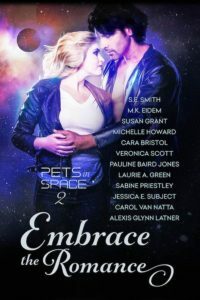 For anyone who sends me their receipt for Embrace the Romance, I will send you a free copy of my story from Pets in Space 1 – A Mate for Matrix. You cannot get A Mate for Matrix anywhere. Send your receipt to GetMyBookOutThere@gmail.com. Offer ends November 11th. I share a little about A Mate for Matrix, out October 11th in the Pets in Space anthology. I can’t wait for you to meet a younger Gracie from Gracie’s Touch and discover how the Alluthans discover Earth.